What better place to explore your interests and ideas than at Knoxbrooke Community! 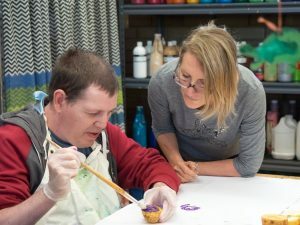 Knoxbrooke Community offers an engaging Day Service Program for adults with a disability. Bringing tradition and a true connection to the local community, our programs embrace innovation, ideas and new experiences tailored to the individual. Our programs run from Monday to Friday, 9.00am—3.00pm 46 weeks of the year. Ask us how your NDIS package can fund your day service activities. Always a vibrant hub of activity, Knoxbrooke Community offers a wide-range of tailored and engaging group activities with an emphasis on life skills development and community participation. With a huge range of programs on offer there is sure to be something of interest!